Without a doubt, beginning acupuncture treatment three months before your IVF transfer will enhance your chances of a successful pregnancy. Studies have shown that women who underwent acupuncture before, during and after IVF embryo transfer increased their chances of pregnancy by up to 42 percent. Why is this important? The pregnancy success rate of those who did not undergo acupuncture was only 26 percent. These phenomenal IVF success rates are why New Hope Fertility NYC is set to unveil its in-house acupuncture therapy treatment program in July of 2017! Our acupuncturists are specially trained in acupuncture therapy with a focus on treating women’s infertility. The World Health Organization (WHO) and the National Institutes for Health have found that acupuncture is a viable and accepted method of treating female infertility. Acupuncture points are located on meridians through which gi vital energy runs. The procedure involves the insertion of very thin needles through the patient’s skin in targeted areas of the head, torso, limbs and extremities. These needles are inserted at various depths, depending upon the patient’s diagnosed medical condition. A healthy body is the result of a harmonious balance of the life force known by traditional Chinese medicine as gi or chi – energies flowing through pathways within the body. 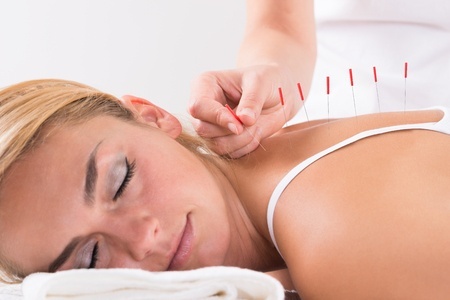 There are 350 acupuncture points in the human body. The body’s energy pathways are accessed through the insertion of small, thin needles in targeted areas of discomfort to release or redirect the body’s energy. Through acupuncture therapy, the body is brought back into its proper balance. That’s not all the good news. Other holistic therapies have proved to help IVF pregnancy success rates. These therapies can be used in conjunction with acupuncture to enhance your IVF pregnancy success rate. Although coverage varies according to providers and states, your insurance policy may cover the cost of acupuncture treatment. The insurance experts at New Hope Fertility NYC will help you to explore all possible insurance coverage for acupuncture and assist in processing your claims. Prepare for your IVF treatment by getting as much assistance as possible to reduce your financial stress. The cost of conventional IVF ranges between $7,500 and $12,000 – depending on the patient’s medical needs and personal desires. The cost of fertility medications for single fresh IVF cycle ranges between $2,500 and $5,000. Introducing IVF SURE™ by New Hope Fertility NYC – a revolutionary IVF refund guarantee program. IVF SURE™ is principled on outcome-based pricing minimizing the financial risk of IVF. Why is this important? No hidden IVF fees or costs. Our patients pay a fixed fee for three (3) IVF cycles. If a viable pregnancy is not achieve, the patient is refunded the fixed amount of money invested in three (3) IVF cycles. Patients pay a fixed fee of $25,000 for three (3) fresh cycles of conventional IVF treatment within a 9-month period. If a viable pregnancy is not achieved within this 9 month period, patients are refunded the fixed fee. With IVF SURE™, patients typically only incur the cost of fertility medications. IVF SURE™ pricing does not include the cost of in-house acupuncture therapy. The fertility specialists at New Hope Fertility NYC want to do everything possible to treat your infertility. Whether you are exploring IVF – or a less invasive procedure – it is important to work with a fertility care team having the experience to accurately diagnose the underlying cause of your infertility. Then, a customized fertility treatment plan meeting your medical and personal needs can be designed specifically for you. To schedule your initial consultation with Dr. John Zhang – call 917.525.5496.
drjohnzhang, July 25, 2017. No Comments. Category: Acupuncture and IVF.